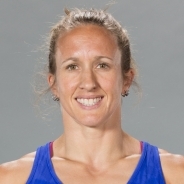 Before 2018 CrossFit Games Masters (35-39) Champion, and five-time individual CrossFit Games veteran Anna Tobias became an elite CrossFit athlete, she was an elite sailor—an Olympian, to be exact, competing in the 2008 and 2012 Summer Olympics, taking gold in 2008 in the laser radial class. She started CrossFit in 2011 while training for the 2012 Olympics. Though she qualified for the 2012 South East Regional, she declined her invitation to focus on training for the Olympic trials. In 2013, she made her first CrossFit Games appearance, finishing in the top 22 each year since with an individual career-best finish of ninth place in 2013, and winning the masters in 2018. Tobias trains at, coaches, and manages T2 CrossFit in South Fayette, PA.